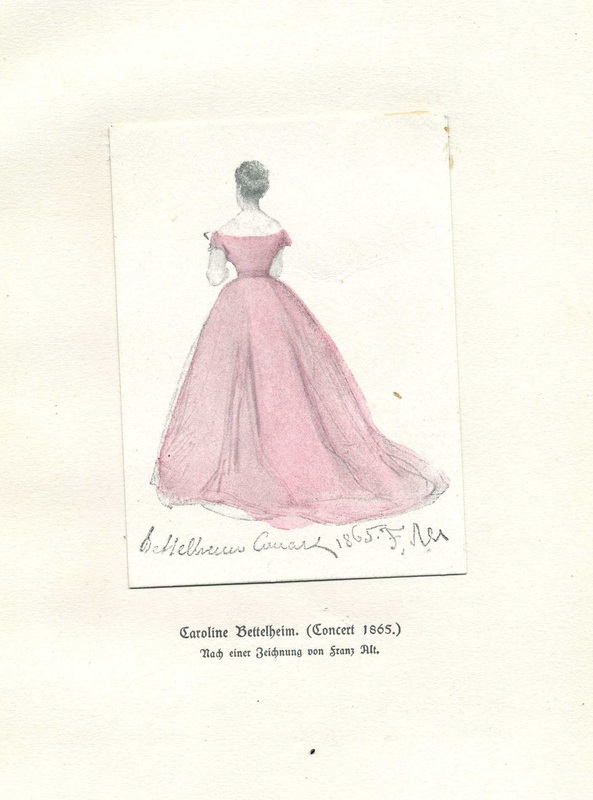 A biography of the Viennese Royal Opera singer, Caroline von Gomperz-Bettelheim* is one of the treasures of the Judaica Suite at the University of Florida. Caroline had a strong stage presence and a rare alto voice which attracted great attention, and for the next six years she appeared in both grand and light operatic roles. She also starred on the stage in other European cities, including Covent Garden in London. In 1867, she gave up her career to marry the Austrian politician, Ritter Julius von Gomperz (1824-1909). After marriage, Caroline appeared in public only on special occasions, such as the grand event in 1876 to celebrate Beethoven in which she sang with Liszt in a Handel oratorio under the direction of Brahms. Today, Caroline’s portrait hangs in the British National Portrait Gallery. Not only is our copy of her biography scarce (only five copies are held in US academic libraries), it is particularly special because the ghost of Caroline floats in its flyleaf. 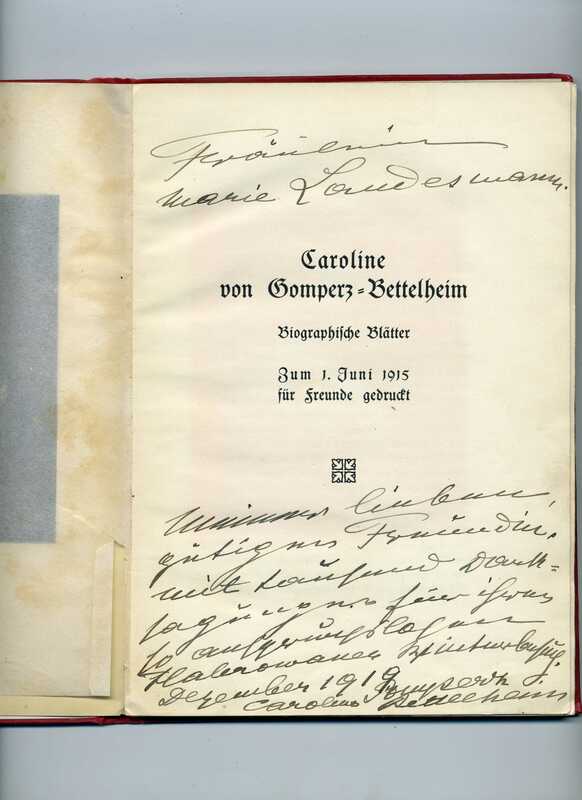 Our copy contains a handwritten dedication to her friend, Marie Landesmann, which Caroline penned and signed in September 1919. Marie’s ghost is there too, inviting us to ponder her identity. Given the circles in which Caroline moved, it is highly likely that this was Marie Landesmann (b. 1857), daughter and secretary of the celebrated Austrian novelist and poet, Heinrich Landesmann (1821-1902) best known by his pseudonym, Hieronymus Lorm. At the age of 15, after suffering many illnesses as a child, Lorm’s eyesight and hearing were almost destroyed. Later in life, when he became completely blind and deaf, his devoted daughter, Marie, served as his eyes and ears. Towards the end of his life, Lorm developed a form of tactile signing, the Lorm Deafblind Manual Alphabet. This alphabet is now the standard form of tactile signing in Europe. Lorm had not wanted to publicize his system, so Marie published it after his death in 1908. * Thus one wonders, as Marie’s ghost hovers around both books, how much input she had when it came to preparing the system for publication: was she a mere secretary, or did she help shape its tenets? Caroline’s story was curtailed by marriage; Marie’s hidden tale is unfinished. *Marie Landesmann, Dr. Phil. Heinrich Landesmanns leicht fassliche und einfach ausführbare Finger-Zeichensprache für Taubstume Taube, Taubblinde und Schwerhörige. Brünn: Friedrich Irrgang, 1908. This entry was posted in Price Library of Judaica. Bookmark the permalink.